09 Aug 2018 by Junade Ali. In February, Troy Hunt unveiled Pwned Passwords v2. Containing over half a billion real world leaked passwords, this database provides a vital tool for correcting the course of how the industry combats modern threats against password security. In supporting this project; I built a k-Anonymity model to add a layer of security to performed queries. This model allows for enhanced caching by mapping multiple leaked password hashes to a single hash prefix and additionally being performed in a deterministic HTTP-friendly way (which allows caching whereas other implementations of Private Set Intersection require a degree of randomness). Since launch, PwnedPasswords, using this anonymity model and delivered by Cloudflare, has been implemented in a widespread way across a wide variety of platforms - from site like EVE Online and Kogan to tools like 1Password and Okta's PassProtect. The anonymity model is also used by Firefox Monitor when checking if an email is in a data breach. Since it has been adopted, Troy has tweeted out about the high cache hit ratio; and people have been asking me about my "secret ways" of gaining such a high cache hit ratio. Over time I touched various pieces of Cloudflare's caching systems; in late 2016 I worked to bring Bypass Cache on Cookie functionality to our self-service Business plan users and wrestled with cache implications of CSRF tokens - however Pwned Passwords was far more fun to help show the power of Cloudflare's cache functionality from the perspective of a user. Will @IcyApril secret ways ever be released?! It is worth noting that PwnedPasswords is not like a typical website in terms of caching - it contains 16^5 possible API queries (any possible form of five hexadecimal charecters, in total over a million possible queries) in order to guarantee k-Anonymity in the API. Whilst the API guarantees k-Anonymity, it does not guarantee l-Diversity, meaning individual queries can occur more than others. For ordinary websites, with fewer assets, the cache hit ratio can be far greater. An example of this is another site Troy set-up using our barebones free plan; by simply configuring a Page Rule with the Cache Everything option (and setting an Edge Cache TTL option, should the Cache-Control headers from your origin not do so), you are able to cache static HTML easily. Indeed, the fact the queries are usually API queries makes a substantial difference. When optimising caching, the most important thing to look for is instances where the same cache asset is stored multiple times for different cache keys; for some assets this may involve selectively ignoring query strings for cache purposes, but for APIs the devil is more in the detail. In the headers of this request to PwnedPasswords.com, you can see the request contains an Origin header of the querying site. This header is often useful for mitigating Cross-Site Request Forgery (CSRF) vulnerabilities by only allowing certain Origins to make HTTP requests using Cross-Origin Resource Sharing (CORS). In the context of an API, this does not nessecarily make sense where there is no state (i.e. cookies). However, Cloudflare's default Cache Key contains this header for those who wish to use it. This means, Cloudflare will store a new cached copy of the asset whenever a different Origin header is present. Whilst this is ordinarily not a problem (most sites have one Origin header, or just a handful when using CORS), PwnedPasswords has Origin headers coming from websites all over the internet. As Pwned Passwords will always respond with the same for a given request, regardless of the Origin header - we are able to remove this header from the Cache Key using our Custom Cache Key functionality. One thing I realised after speaking to Stefán Jökull Sigurðarson from EVE Online was that different users were querying assets using different casing; for example, instead of range/A94A8 - a request to range/a94a8 would result in the same asset. As the Cache Key accounted for case sensitivity, the asset would be cached twice. Unfortuantely, the API was already public with both forms of casing being acceptable once I started these optimisations. Incidentially, our Workers team are working on some really cool stuff around controlling our cache APIs at a fine grained level, you'll be able to see some of that stuff in due course by following this blog. 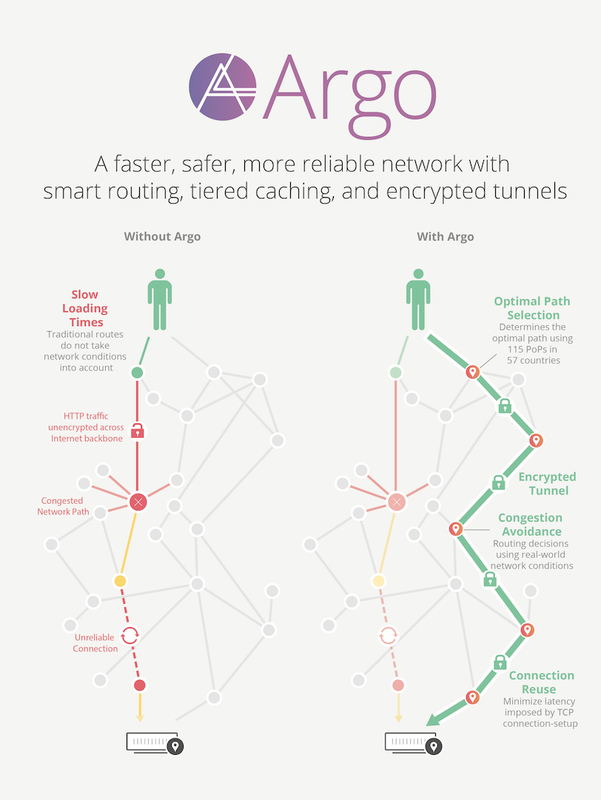 Finally, Argo plays an important part in improving Cache Hit ratio. Once toggled on, it is known for optimising speed at which traffic travels around the internet - but it also means that when traffic is routed from one Cloudflare data center to another, if an asset is cached closer to the origin web server, the asset will be served from that data center. In essence, it offers Tiered Cache functionality; by making sure when traffic comes from a less used Cloudflare data center, it can still utilise the cache from a data center recieving greater traffic (and more likely to have an asset in cache). This prevents an asset from having to travel all the way around the world whilst still being served from cache (even if not optimally close to the user). By using Cloudflare's caching functionality, we are able to reduce the amount of times a single asset is in cache by accidental variations in the request parameters. Workers offers a mechanism to control the cache of assets on Cloudflare, with more fine-grained controls under active development. Interested in helping debug performance, cache and security issues for websites of all sizes? We're hiring for Support Engineers to join us in London, and additionally those speaking Japanese, Korean or Mandarin in our Singapore office.